A cucumber fence is fun, and a space saving way to grow cucumbers. If you haven’t tried growing cucumbers on a fence, you’ll be in for a pleasant surprise. Read on to learn the benefits and how to grow cucumbers on a fence. Cucumbers naturally want to climb, but often in the home garden, we don’t provide any support and they sprawl on the ground. 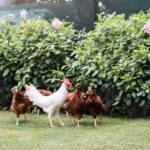 One of the greatest advantages of cucumber fences is the fact that they save a significant amount of space in the garden by allowing the cucumbers to follow their climbing nature. When you grow cucumbers on a fence, you not only save space but create a healthier environment for the cucumbers to grow. By planting cucumbers on a fence, there’s better airflow around the plant, which helps prevent powdery mildew and other diseases. Growing cucumbers on a fence also helps to hold them out of the reach of garden pests that may damage the fruit. Having a cucumber fence also allows for more even sun on the cucumbers themselves, which means that the cucumbers will be more evenly green (no yellow spots) and less apt to rot due to damp conditions. Typically, when creating cucumber fences, gardeners use an existing fence in their garden. The fence should be a wire type fence, like chain link or chicken wire. This will allow the tendrils on the cucumber vine to have something to hold onto. If you don’t have an existing fence to make a cucumber fence, you can build one easily. Simply drive two posts or stakes into the ground at each end of row where you will be growing cucumbers. Stretch a section of chicken wire between the two posts and staple the chicken wire to the posts. Once you have chosen or built the fence you will be using as a cucumber fence, you can start planting the cucumbers. When planting cucumbers on a fence, you’ll plant the cucumber at the base of the fence 12 inches apart. 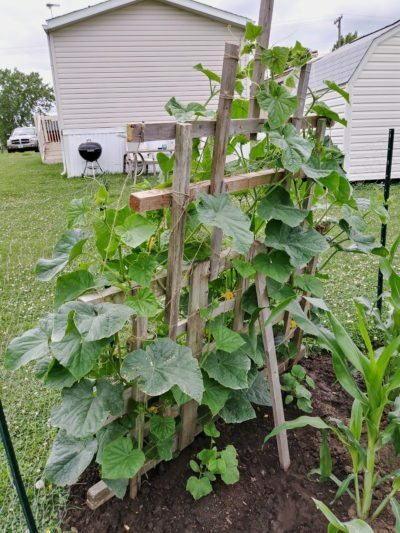 As the cucumbers start to grow, encourage them to grow up the cumber fences by gently positioning the emerging vine on the fence. Once the cucumber vine starts to wrap its tendrils around the wire, you can stop helping it as it will continue to climb on its own. Once fruit appears, you don’t need to do anything else. The vines are more than capable of supporting the weight of the fruit, but when you harvest the cucumbers, make sure to cut the fruit off rather than pull or twist it off as this may damage the vine. Growing cucumbers on a fence is an excellent way to conserve space and grow better cucumbers.